The premiere of the unique project Too Soon Too Late takes place on 26th May in BOZAR, the center for fine arts in Brussels. The in-situ performative exhibition is the reminder of the 100th anniversary of 1918. About twenty artists from ten countries have united under the artistic supervision of Tomáš Procházka and Cristina Maldonado. The project was initiated by the Czech Centre Brussels and the Brussels cultural center BOZAR. Dramaturgy and coordination is arranged by the Arts and Theatre Institute (ATI) and cultural institutions from V4 countries, Romania, Lithuania and Austria participate in co-production. The performative exhibition Too Soon Too Late is part of the cycle “1918, European Dreams of Modernity – 100 Years On”, which takes place throughout the year in BOZAR, the center for fine arts. 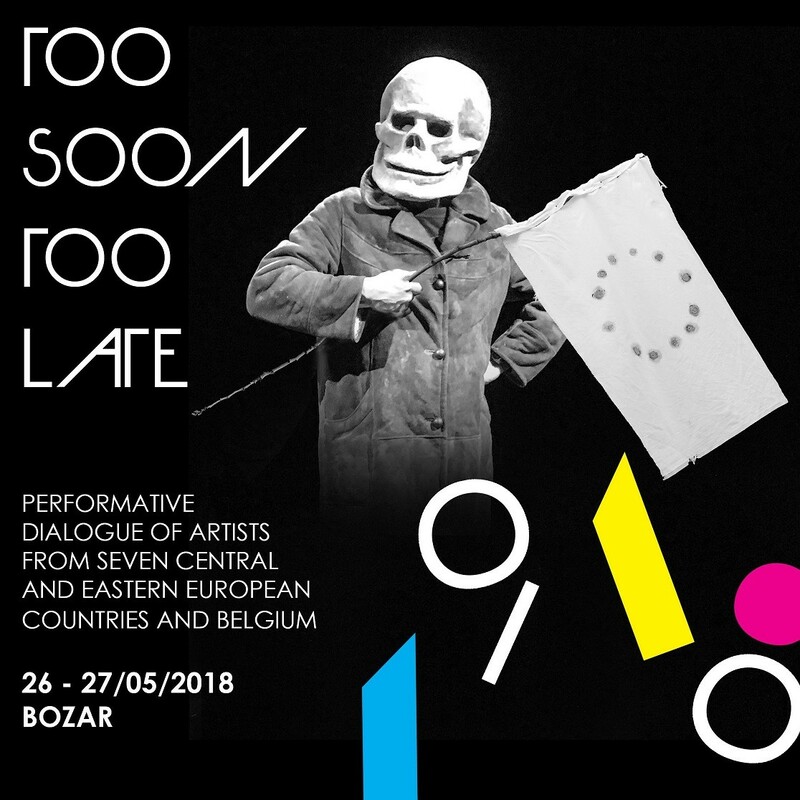 “The project Too Soon Too Late is undoubtedly a unique opportunity for international cooperation among performers from Central and Eastern Europe, interconnection with Belgian artists and presentation in the prestigious Belgian national institution BOZAR. The complicated architecture of the art deco building from 1928, which ranks among the supreme works by famous Belgian architect Victor Horta, is a big challenge for any creation. The multi-story complex of theatre, music, exhibition, film and multifunctional halls symbolically connects the royal palace with the center of Brussels. It embodies a perfectly democratic idea of equal opportunities for presentation of all kinds of art and accessibility for audience of any age, origin and specialization. The topics of identity, interpretation of history and heritage of the avant-garde between the wars, as well as ideas of equality, emancipation and democracy are reflected in the contributions by artists, yet they have been naturally projected into the process of making the performative exhibition, which is a result of a long search for a consensus among various team members from all places in Europe. Even this is the testimony and success,” Martina Pecková Černá, the coordinator, explains the reason why the ATI got involved in the project. The project Too Soon Too Late was preceded by the dialogue of artists and theoreticians from Central and Eastern Europe and Belgium, who first met in Brussels in November 2017 at the symposium Central and Eastern Modernity Rebuilding organized by the ATI, Université Libre Brusel and the house for performing arts La Bellone. The discussions dealt with the past, present and future of Europe and the role of art in contemporary society, they referred to utopian and apocalyptic visions between the wars, as well as the beginnings of social and demographic changes, which have had an impact on our present. The final performative exhibition, which has been in the process of making since December last year, provides the audience with the opportunity to walk freely in the space in four re-runs. Everyone is free to watch dance performances, performative actions and video installations accompanied by music, taking place continuously in loops for 90 minutes. The year 1918 in the history of East Central Europe is primarily associated with the collapse of empires and the rise of new nation states. Remembering the history of 1918 in East Central Europe also means shedding light on the shared experience that is not very well known in Western Europe. Moreover, 1918 marks not only the birth of new nation states but it stands as a powerful symbol of the desire of so many people in Europe to construct a better future and embrace modernity. The years following the declaration of independence all across the region were the time of profound political and social changes: the time of crafting democracies, testing the limits of mass politics and inventing social state, time of unprecedented mobility from countryside to the cities and unrivalled experimentation in arts, science and technology that continues to inspire people across the globe today. The shattered world order allowed to many women, immigrants, invalids, formerly underprivileged citizens to claim a new role in society. These ambitions were reflected in the arts, burgeoning unprecedently in the new nation states. What have we kept from that period? What is the meaning of avant-garde today? And what is the role of historical memory in arts today? There are many topics resonating in the Too Soon Too Late project. In their dance and music production, Miřenka Čechová together with Markéta Vacovská (Czech Republic) and Agnija Šeiko (Lithuania) tell the story of dozens of women about the emancipation movement through experience of the past one hundred years. The dance pair Ballets Confidentiels (Johanne Saunier and Ine Claes, Belgium) present the fragile and elegant performance “The Fall”, inspired by Tristan Tzara’s Dada Manifesto and is the symbol of hope and faith in the cycle of life. Monika Drożyńska (Poland) demonstrates the opening gap between poverty and wealth by embroidering the European flag dyed with a beetroot juice. The Romanian and Norwegian pair Florin Flueras and Brynjar Bandlien will reinterpret the master piece “The Hammer without a Master” by Romanian choreographer Stere Popescu. The preview for journalists will take place on Friday, 25th May 2018. The productions for the general public will follow on 26th and 27th May 2018. Other presentations of the performative exhibition are planned for Budapest and Prague. The main organizers of the project are: Czech Center Brussels; Arts and Theatre Institute; BOZAR, Center for Fine Arts, Brussels. The partners of the project are: Polish Institute, Brussels; Zbigniew Raszewski Theatre Institute, Poland; Theatre Institute, Slovakia; Balassi Institute, Cultural Service of the Embassy of Hungary in Brussels; Hungarian Theatre Museum and Institute, Hungary, Lithuanian Culture Institute, Vilnius, Romanian Culture Institute, Brussels; Austrian Cultural Forum, Brussels, The National Centre for Dance, Romania. The project was supported in frame of the grant program of the International Visegrad Fund.